Why are some people born more beautiful, or more intelligent, than others are? Why does not God give everyone equal beauty, abilities and talents? It is not God's partiality or fault. It is the human being who is responsible. His actions, thoughts and words are responsible for all good and bad. It is the mind that creates the differences. Pleasure is an interval between two pains. It is the way you look at things that matters. There is a vast ocean of talents and qualities. All human beings have vessels to fill. Some people, through their actions, are able to fill the vessels to the brim; some fill only half; others can fill only a quarter, or less. They possess intelligence, beauty, talents, and etceteras, according to how much they can fill their vessels. You even judge beauty these days, as in Miss India, Miss World. But, that is all physical beauty, which is transient. What is important is the beauty of the atma (Self). How are good or bad actions carried into the next birth? Swaasha (breath) carries the actions, for the breath stops when a person dies. The body is still there after death and we call it a corpse and burn it as useless. So, the body cannot carry anything with it, just as a flower cannot carry its fragrance. It is a breeze that wafts the scent of the flower and makes its fragrance reach you. Similarly, imagine a municipal lorry, the breeze carries the bad odour to you again! In the same manner, good and bad actions are carried by the breath and surround you in the next birth like an invisible garland. The pattern of your life is then governed by what the garland has good or bad scent. That is why man must understand that everything he does has a reaction, a reverberation and a reflection. It is he who writes his own destiny by his actions. It is essential for man to live a good life with good thoughts and good actions. Only through such a life can he realise the divinity in him. The concept Aham Brahmasmi (I am Brahma = God) is also incorrect, since it indicates duality. Aham (I) and Brahma (God) become separate. The statement ought to he Aham Aham (I am I). Many people feel that Hindus worship countless gods. How did this happen? India has a wonderful religious tradition. It has something for everyone, to suit everyone's needs. Many people do not understand this excellent idea and make derisory comments on our having too many gods. This tradition has evolved to suit the needs of different people, just as we have shirts of varying types and sizes to fit different people. With the ideal of One God, there is only one shirt and, if it does not fit or if it is unsuitable, people turn away from God. But, here, if someone likes Krishna, they can worship Krishna; others can worship Rama, or Narayana, or Shiva, or even snakes and lions! What more do you need to propagate the idea that God is in everything everywhere? That is why I often say don't worship God as a picture, but worship the picture as God. This will slowly lead to the realization of God in you. That is where the Hindu spiritual path is practical and good. Why does not God prevent cruelties in the world? God is only a witness (saakshibhoota). He does not act. Man acts according to the dictates of his intellect (buddhi) and himself suffers the consequences of his actions (karma). There is neither good nor bad for God. Take the knife as an example. A murderer uses a knife to kill another man, a slaughterer uses a knife to slay animals, a surgeon uses a knife to amputate, and a cook uses a knife to chop vegetables. If a magnet is placed among all these knives, it will attract them all equally and not according to the kind of tasks they perform. God is like this magnet. All knives are the same to Him. However, the hands that wield the knives have to bear the consequences of their actions, dependent on right and wrong. When we have troubles and are in difficulties and we pray to God, why does He not take them away'? Troubles and difficulties are part and parcel of human life. They are the results of your karmas. There is no point in praying to God to wipe away all such troubles and difficulties. The right type of prayer would be to ask God for courage and strength to bear all the difficulties, problems and tragedy with equanimity. What is the difference between the politics of yesterday and those of today? The present state of affairs can be described as the state of jumps and bumps. Now, take the example of your body and limbs. Each limb is important in forming the composite whole. All the limbs joined together make up the body, which is the deha (body, person). Similarly, in the desha (country, nation), every aspect should be tended to, just as one takes care of every part of the body. The view that women should not take ups Brahma vidya (spiritual knowledge), nor chants the Omkara. Is this correct? Also, in ancient times, were spiritual sadhanas (endeavours) forbidden to women? Brahma vidya and chitta shuddhi (spiritual knowledge and purity of consciousness) do not depend on whether a person is a man or a woman. All have an equal right to benefit from Brahma vidya provided only they are able to take it up with discipline and dedication. At no time have there been any taboos against women. Lord Vishnu (the Preserver) taught Bhu Devi (the Goddess Earth) the glory of the Bhagavad- Gita. Parameshwara (Shiva) taught Parvati the Brahma tatva (divine essence) through the Guru Gita. Ishwara (Shiva) initiated Parvati into yoga shastra and mantra shastra (science of yoga and science of mantra). The Brihadaranyaka Upanishad mentions Yajnavalkya teaching Maitreyi the Brahma vidya. So, women in ancient times were not denied the pursuit of spirituality. The Brihadaranyaka Upanishad mentions Ciargi and Maitreyi hasking in the splendour of sannyasa (renunciation) and brahmacharya (celibacy, chastity). Madaalasa Chudaala and others were able to receive Brahma jnana (divine wisdom) while in the grahastha (householder, i.e. married) stage of life. Even today, there are many that belong to this vast category. It is sheer absurdity to deny women the right to earn Brahma jnana. But, in worldly matters, it is necessary for them to maintain certain limitations in the interests of dharma (righteousness) and loka kalyana (the good of the people/world). For the sake of safeguarding morality and for the social health of the world, women have to accept some restrictions. This is not to say that there is any fundamental inferiority in them. Even pundits acquire their jnana through the reverential homage they pay to the feminine deity Saraswati. The divine patrons of learning, prosperity and wisdom are all feminine: Saraswati, Lakshmi and Parvati. This should show the reverence paid to women. Why does Swami give gifts? Gifts of rings and pendants are an expression of Swami's love... It is not that Swami wants to draw people to him with gifts. When you wish to show affection to your son, or if you want to make someone happy, you make him a sports shirt or buy him a present, do you not? Swami also wants to bring happiness in this manner. Does a gift also act as a protective talisman? Yes! They are also like my visiting cards and send me instant flashes when the person is in danger or in need of my help. Sometimes, these gifts are made for specific reasons: for the sake of a devotee's health, or I may give someone a gem stone so that rays from it may constantly influence him or her to follow the right path. I want to tell you that whatever Swami does has a purpose. He never does anything without reason. Why does Swami give vibhuti? Flowers, leaves, fruit and other edibles have a temporary life. Even water breeds germs if kept in a vessel for days. Only vibhuti remains unchanged, as it is the final result of the five elements of creation. Our desires have to be reduced to ashes and vibhuti is symbolic of this detachment and renunciation. One's mind has to become desireless and detached like the ashes in which everything is burnt out. It is that kind of pure mind that has to be offered to God. Is it necessary to perform pujas (ritual worship) and ceremonies? Everything depends on the individual concerned. Whatever he or she does has to be done with faith and sincere devotion. God cannot be fooled with mere ritual. What about ceremonies and rites for the dead? Is it wrong not to perform them? This again depends on one's mental attitude. After a person leaves the body, the soul takes birth and takes on a new body somewhere else. You must know this. Upto now you must have had so many lives, you must have been a mother and a daughter so very many times. What is required really is gratitude to one's parents, by remembering them on the day of their death. Though they may shed these bodies in which they are your parents, you still owe them the debts of having given birth to you and of having given you their blood to give you your present form. You can express this gratitude through the ceremonial shraadha rite, or by any other method, even by thinking of them with sincere and loving gratitude on the death anniversary. It is heartfelt feeling that is important. Why doesn't God make people suffer for their sins in the same lifetime? Why in other lives when they cannot know why they suffer? Why does Swami have more restrictions for women? They do not have easy access to Swami! Everyone has the same kind of access to Swami. This does not depend on their being men or women. Everyone receives the same grace, depending on their devotion, their need, or their work. Swami may say so; that nevertheless women have more hurdles to overcome when they want to convey something to Swami. There are times when the man who stands next to me never catches my attention, as hard as he may try; while a devotee sitting far away in a corner amid a crowd easily catches it. It all depends on who has to receive what and when. Everything happens according to that will, not because of the physical form of man or woman. Also these differences are visible to you at your level of consciousness. For Swami, these are not differences that count. The atma is not different in man or woman. 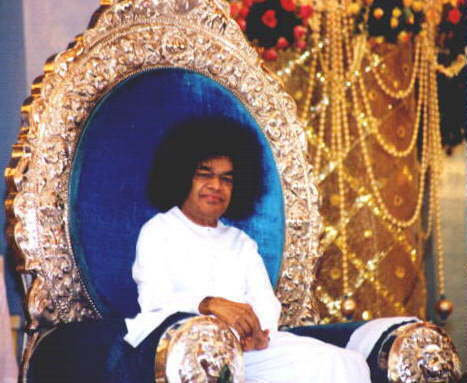 The atma is eternally conscious, pure and self-effulgent. The atma is neither masculine nor feminine, nor yet neutral. It is only the body that limits, deludes and wears names. What is the principal cause of all troubles and sorrow? Attachment and ego are the main causes. Jealousy is another factor. How can jealousy be conquered? By having love for everyone, by thinking of others with love and wishing them well. More than all, by realizing that jealousy is physically most harmful. It does damage your internal system and, later on, you will have to suffer the karma of the bad things caused by your jealousy. Why has God created bad traits and negative tendencies in humans? These are results of man's own actions. God is only a witness to events. Human beings are themselves responsible for the good and the bad in them. Remember that the things you do not do can never hurt you. But Swami says that there is nothing good or bad! Yes! This is from God's point of view. For humans, this is a relative matter, since what is good for one may be bad for another. What is good at one time may be bad in another season. Good and bad are thus two states take two fruits, phalam, which are good. Once they are eaten and digested, they become excreta, malam, and that is bad. Scientists say that something cannot he created out of nothing. Yes, hut what they think of, as nothing is really anything. There is no nothingness in the Universe. The scientist makes such statements because, with his limited vision, he cannot see all things or know them. Both science and spirituality begin as inquiry, a quest. Spirituality comes full circle, like the letter O, while science reaches the half circle stage, resembling a C. Science has a lot of catching up to do, for it has only discovered a fraction of the truth. It is like a small piece of cloth you can see protruding from a fist: you can only conjecture about the whole, its looks and size, for it is hidden and you cannot see it. But, science has made many advances flights to the moon and other planets, for instance. Yes. Whatever science has done for humanity is to be welcomed, hut it is still a growing and advancing field. Scientists used to say that you couldnt split the atom and today that is no longer true. The scientist learns as he progresses. Today's investigations become old tomorrow and lead to new investigations, which will become old the day after tomorrow. There is no end to this, and so the truth lies in something that contains within it both the old and the new. God alone envelops the old and the new and so the best way to advance is Godward.